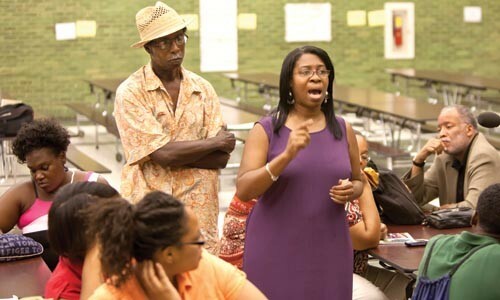 Parent Donna Simms-Key sounds off at a July 20 community meeting about the Pittsburgh School District's plans to close and consolidate several schools in the area. Kenneth Huston of the Black Political Empowerment Project expects at least one thing from re-aligning the city's East End schools: BPEP's Coalition Against Violence is going to be busy. "My work is going to [grow] tenfold," says the BPEP community liaison. "We're definitely going to see some violence." The increase, he believes, would result from longstanding neighborhood rivalries held onto by younger generations who could cross paths in a plan proposed by Pittsburgh Public Schools and under consideration by board members. Peabody High currently draws students from Stanton Heights, Lawrenceville, Morningside, Garfield, Larimer, Lincoln-Lemington and Highland Park. Among changes in the proposal, the Peabody program would close in 2011. Students would be given a one-time choice between Milliones, in the Hill District, or Westinghouse, in Homewood. If they don't choose, students will be assigned based on which side of Negley Avenue they live on: Garfield, Stanton Heights, Morningside, Lawrenceville and parts of Highland Park will go to Milliones, and the rest of Highland Park, Larimer and Lincoln-Lemington will head to Westinghouse. Westinghouse would convert to a 6-12 school with two single-gender academies. The sixth- through eighth-graders at Faison K-8 and Lincoln K-8 will go to Westinghouse, and the schools will convert into a K-5. District leaders say the reconfigurations are a result of declining enrollment and the fact that students in the existing schools are underperforming. "These kids, for most of them, traditionally hold onto their neighborhood and that's been a ray of hope," observes Huston. "They really look at this as an invasion." Peabody and Westinghouse have long been rivals in sports and band. But in the early 1990s, gangs like the Bloods, in Garfield, and Crips, in Homewood, came into the city, and violence escalated, says Michael Gay, crime-prevention officer at the Zone 5 city police station. While some still claim those gang associations, Gay says he's more worried about "set claiming," or kids claiming their territory from the neighborhoods in places like Lincoln-Lemington or East Hills. "When you're talking about Peabody and Westinghouse, all you've got to do is look at the history," he says. Pittsburgh Public Schools officials admit such concerns are credible. In redrawing feeder patterns, assistant superintendent Derrick Lopez says the district acted on suggestions from police and community leaders. "We're looking for ways to make families more comfortable with the choices," says Lopez. "We're going to dig deeply into the process to find solutions." The district plans to hold a community meeting next week. No specific transition plans are in place yet, but school leaders say they have a year for the process. The neighborhood divisions are referred to in general terms by administrators, community leaders and residents. "It's not so much the red bandanas or blue bandanas, but everyone has their own little clique," says Tracee Kirkland, education chair for the 12th Ward Democrats, which covers Larimer, Lincoln-Lemington and parts of Homewood. If the district goes through with the changes, says 12th Ward chair Jacque Fielder, the schools should educate students in conflict-resolution skills, something she says would reduce the likelihood of violence. "A lot of the kids don't even know what's wrong. It's just that someone calls you a name, and they want to knock the mess out of them," Fielder says. Fielder and Kirkland also believe the decision is being rushed. An informal City Paper survey of parents at Chadwick Park in the Lincoln-Lemington-Belmar area found most had strong feelings against the plan, primarily as a result of the mixing of neighborhoods. "You might as well line 'em the first day of school and let them shoot at each other to get it over with," said one Lincoln-Lemington parent. Darnell Farrow chose to put his sixth-grade daughter in Montessori K-8 so she wouldn't have had to go to Westinghouse based on their current and future feeder pattern. "There's so much going in Homewood as far as shooting around the school," he says. That's something Gay at Zone 5 says has given Westinghouse a bad rap. "Kids inside the school, to me, are not the problem. It's the element outside," he says. In Homewood, which Gay says has its own gang divisions like other areas, crime comes from gang activity, drugs and some "who just want to do dumb things." It's not just a particular neighborhood, either, he observes. "It's a different culture now. You've got 13-year-olds cussing out adults," he says. "It takes an entire community to raise a child." And further, he believes the situation wouldn't be as worrisome if it were the other way around. Peabody sits in a predominantly commercial area, whereas Westinghouse is tucked along a residential street in the middle of Homewood. High school students who live within two miles of a school are considered walkers. Those living further are eligible for transportation. Violence isn't the only concern, nor is it students who might cause trouble. Huston at BPEP points out that there are criminal organizations who recruit some of the youth. He adds that a lot of violence "is stemming from economic disparities among African Americans." And it's not just confined to the East End, he says. "The issues plaguing our youth are not being addressed at the grass-roots level," Huston says. "The corporate sector isn't serious about these issues and it's very, very troubling." Board member Sharene Shealey, whose district encompasses most of the affected schools, believes the plan has merit because it addresses failing schools. "The current situation is bad. It's not in their favor to keep these two buildings as-is," she says. "Something has to give." Shealey understands the concerns and says there must be an "overt effort to demonstrate this is safe. ... But I have no clue what that looks like." Assistant superintendent Lopez maintains that the recommendation came from an advisory panel of residents, students, leaders and teachers on a committee. Two public community input meetings were held at the respective high schools this winter and both were crowded with students and parents. "The challenge will be the change and people being uncomfortable with that change," he says. "That's why we have to have as many conversations with students and parents as we possibly can." Arita Gilliam, a panel member, notes that mixing neighborhood schools isn't a new concept in Pittsburgh, citing examples like Schenley. She also says there are few violent incidents at Westinghouse compared to other city schools. And, she adds, meeting students from other parts of the city can be an education in itself. "Those kids who don't have options to move outside of the community, school becomes a place where they can develop an understanding of other people," Gilliam says. "I hear this conversation about community rivalries all the time. ... A school district either has tolerance or it doesn't."